Skirrow is a rare name, and yet there are around five hundred Skirrows living in the UK, and many now living abroad, especially in Canada and the USA. If your name is Skirrow you may wonder where on earth you came from? Almost certainly from Wharfdale in Yorkshire - from Baildon, Otley and surrounding villages. Follow the links for more of the story, including my family tree poster! Since this site was first put onto the Web, many Skirrow's have contacted me with information. What has become clear from the many e-mails is that pretty well without exception they report ancestors in the Wharfedale area of Yorkshire - Baildon, Otley, Bradford. However, there seem to have been many Skirrow lines already established in these places by the nineteenth century, so that only a few names have been linked to my own tree. This is not surprising, given that the name skirrow is reported to go back as far as the year 1600 and possibly 1300. 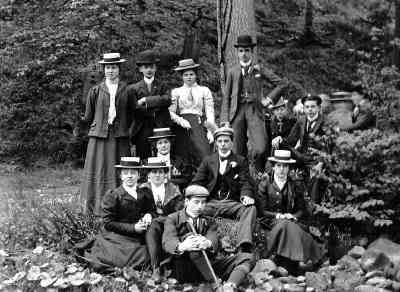 The photograph below shows my own grandfather in Shipley Glen around 1905, with some of his relatives on a sunday outing. This photo and some inscribed books in my parents bookcase led me to Baildon where I uncovered my own story - see 'Visiting the Dead Dudes'.